Our delivery charges are based on boxes, containing up to 25kg** of shopping each, which is quite a lot of shopping and will be approximately 55cm3 (55cm x 55cm x 55cm). Costs are dependant upon your location, if you register and sign in, with your delivery address set correctly, delivery rates will be shown for your area. *Free Shipping: Makes shipping free for a standard one box order for the UK mainland (normally £5.99). Premium UK delivery areas (Highlands etc), international orders and orders exceeding one box will see a £5.99 deduction from the final shipping cost. Basket spend must exceed £55.00. Multi-box shipping deals are available in England, Wales and parts of Scotland only. ** Please note that the gross weight of a product also includes the weight of packaging required to send the order to you. We look at each product on an individual basis and round up where required. For example if you order a case of a product we will keep the products in the case, which adds a little extra weight. 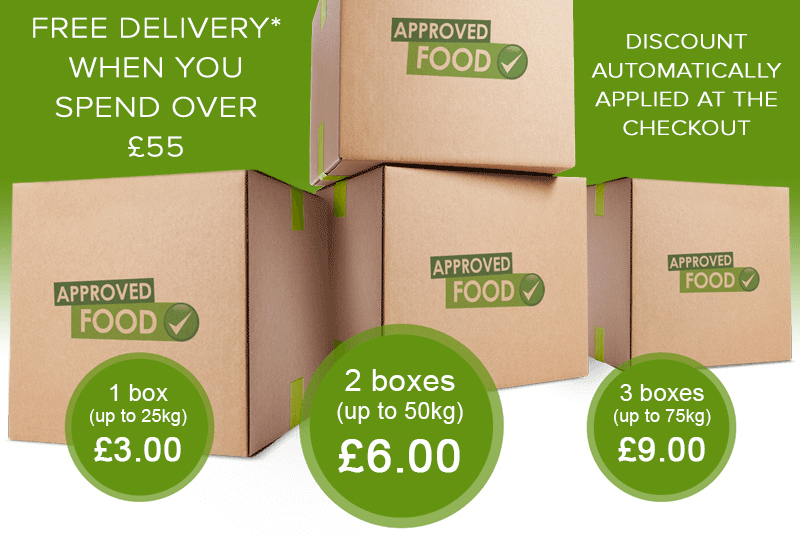 You can order online and then arrange to collect your shopping for free from our warehouse: Approved Food Ltd., Parkway Close, Sheffield, South Yorkshire, S9 4WJ. Collections times are Monday to Friday, 8am - 4:30pm. When collecting an order, please have your order reference number to hand. Please be aware we operate a Challenge 25 policy. For any orders containing alcohol please can you bring photographic ID (Driving Licence, Passport or Pass hologram ID). If this option is not available to you when placing your order please change your delivery address to our Warehouse address (as above). Delivery should be within 2 to 3 working days after dispatch from our warehouse in Sheffield. We use a number of national courier company's that have track and trace services. We?ll choose the right service for you based on your location and the contents of your order. If you have any courier queries, please email our Customer Service team (cs@approvedfood.co.uk). This can include, but is not limited to, leaving your parcel in a safe place or with a neighbour, or non-delivery of goods. We aim to dispatch all completed orders received before 2pm within 2 working days (Mon-Fri) and expect most of the orders to reach our UK customers within 72 hours of dispatch (please note: we are dependent on our delivery services and therefore cannot guarantee the timeframe). Please be advised that these delivery times only apply to 'business days'. If your order is placed before 2pm on a Friday it will be dispatched for delivery along with any other weekend orders on a Monday delivery service. Please ensure all correct details are used on the shipping address at checkout, including the unit and sub unit. Also check for prohibited items as your order can be turned away. Once an order has been delivered to a BFPO site the order is classed as delivered and any further queries regarding delivery will have to be raised via BFPO customer service channels.